Before I took pictures of this manicure, I saw a glimpse of just the white half and it made me think of Harvey Two Face from Batman lol. 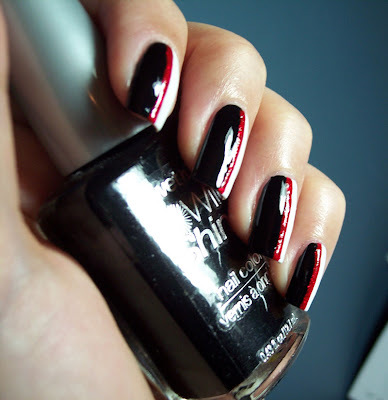 I painted 3 coats of NYC white on half my nail, then 2 coats of wnw black on the other. 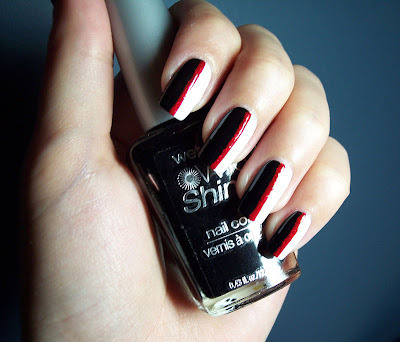 Then I used my red LA Colors nail art polish and painted a stripe down the center! Two-Face is a great name! I love that red line, it makes it look dimensional or something, I can't quite describe it. That is such a cool design! And it does not look TOO difficult. I might try it myself. Thanks for the inspirational photos! This is super pretty, really bold and clean. That is wild! Just a simple line and it makes a big difference. Really pretty. Mary: thank you, I almost left the line out it looked very interesting without it, but as soon as I put 1 line down I knew it was meant to be! avroys: thank you! the nice thing about this design is you have some room for error when painting the other color (in my case black) because you can paint over any boo boos with the middle stripe. Lucy: thank you, yah weird what a single line does. Alexlyndra: I agree, keeping it clean and simple can often turn out good! Ooh la la! I really like this. 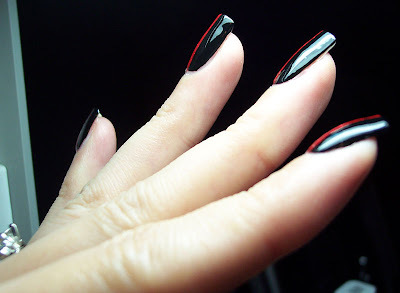 I've never indulged in nail art - just painting in one colour is as far as I go. I think I'd struggle painting my nails on the right hand since I'm right-handed. :( Any advice? Sheenie: Hi! I think you could start out by practicing drawing lines on your right hand. I sometimes struggle too even with the most basic things somedays. The trick for lines is to hold your left hand steady with your paint/polish brush and move your right hand to draw the strokes! To draw other designs, it helps to move your whole arm or move at the elbow (not the wrists). It seems to be more steady that way on your non-dominant hand. Hmm another thing you can try is to place your entire left forearm on the table so that it is steady as p ossible, then you can slide your arm around or slowly move your wrist! Hope one of these works for you! Hi Emelie! I didn't understand what was written but I could see the picture :D It was a little blurry but it looked great!